I thought I should give a cloth diaper update since I spent so much time researching cloth diaper options prior to Jude’s birth. We have been using cloth since about 3 weeks after Jude was born. I ended up with a combination of prefolds and covers and a few all-in-one diapers. I thought I would like the AIOs (all-in-one) because they are just like using a disposable diaper… but it turns out I prefer prefolds and covers. I feel like the AIO diapers don’t breath as well and it’s alot of fabric to throw in the wash for just a little pee. With the prefolds and covers you reuse a cover until it gets dirty or starts to smell and you just change the cloth inside. Jude has already outgrown his newborn diapers and is almost too big for the infant size prefolds (which are supposed fit up to 6mo.) and small size covers. I have been purchasing used covers off diaperswappers.com and have a good stock of medium and large sizes. 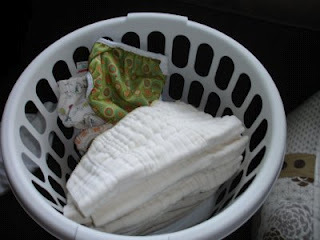 We wash diapers every other night and go through about 12 diapers every 2 days.